Add one chainsaw and you get a nice carved out stump. 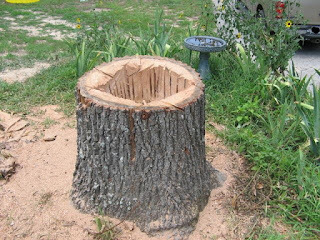 Now take the excess sawdust and wooden bits and pieces and scatter them all around the stump. 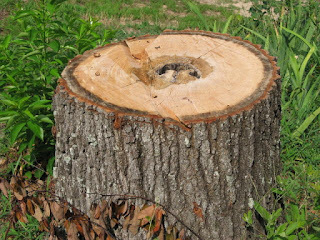 This will attract termites, drawing them into the stump. Finally, tell your spouse you have built them a planter and tell her to plant flowers in them. 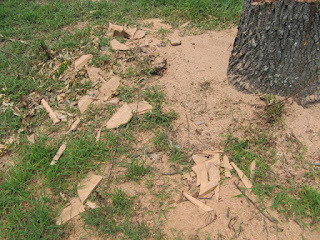 The fire ants will move into the new fresh soil, attracted by the tasty termites. Why should the spouse have to plant flowers? Couldn't the condo builder perform that step and present the spouse with a completed gift of love? actually, yes, that is sort of how it works. Normally the berries are picked, labeled and in the fridge while she is still nestled comfy in bed with a pack of cats.